We have a table with a list of students. Our example consists of three columns: Class, First name, and Last name. Because classes are duplicated, we want to merge them, so they stay in single cells. If you try to merge them, you will notice that the Merge & Center button is inactive. This happens after you convert your data to a table. 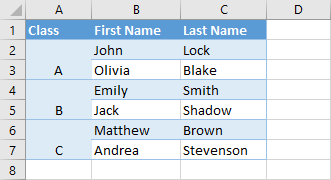 When you apply the table formatting, you also get rid of the features that are available only for the standard ranges. If you want to marge cells inside a table, first you need to convert your table back to standard cells. 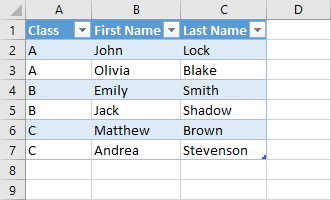 Click any cell inside your table. Navigate to Table Tools >> Design >> Convert to Range. A new popup window will appear. Click Yes. The visual formatting will stay, but you lose the table filtering features. Select range A2:A3 and click to Home >> Alignment >> Merge & Center. Repeat the same steps for ranges A4:A5 and A6:A7. Now, select all the three cells and click Home >> Alignment >> Middle Align. 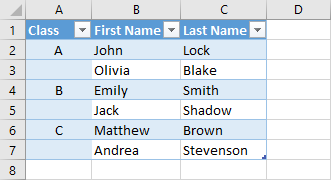 If you try to convert your data into an Excel table the merged cells will be automatically split and the class letter will be present only in the top cell.